Sales are always welcome to bargain shoppers. But if you don’t feel like picking through the end of season clearance sales at Saks and Nordstrom, there are online designer boutiques where you’ll find clothing and accessories, sometimes at rock bottom prices. But figuring out where to start can be intimidating, especially because some are invite-only. But watch out: saving money can be addicting! The online boutiques provide limited quantity designer fashions at a discount. But how? The sites partner with the brands—which allows them to sell directly to their members, safely eliminating several layers of the distribution process. And when they save money, you save money. Many of the sites are invite only, but once you become a member, you will have access to information about what items are going to be available, most often via an email alert. Because it’s a limited offer, you will be alerted close to the time of the sale (usually within an hour). Think of this as shopping at a sample sale without all the hassle. No more running to some warehouse and elbowing someone away from the merchandise. Savings can be up to 70% or more off of the retail price, but the goods go fast, so sign-in early and respond quickly to any alerts you may be interested in. Some sites just require you to sign up. Others are invitation only, so they ask that someone who is already a member gives you an account code for referral. But this is easy to get around. Within five minutes of a doing a web search for “invitation” along with each site we were interested in, we were able to procure an invitational link and join on our own. Here are a few of our favorite sites. We’ve bought at least one thing from each of them, and are happy with the results. Gilt Groupe is a bit higher-end and has a few designers exclusive to their site. They provide access to Men’s, Women’s and Children’s fashions, accessories and jewelry at prices up to 70% off retail. Each sale lasts 36 hours and features hand-selected styles from a single designer. You will get an email the day of the sale telling you what is available and what time to check in. Though it is an invite only site, as mentioned previously, it’s easy to do a search and grab an invite online. Refer friends and if they buy anything from the site, you’ll get $25 off your next purchase. Gilt Groupe accepts returns on unused apparel and footwear for store credit only, within 14 days from the date of purchase. Their list of FINAL SALE items includes accessories, beauty and fragrances, home décor, handbags, hosiery, intimates, jewelry, leather goods, swimwear, sunglasses, vintage, wallets and watches. HauteLook is one of the most popular online sample sale sites and offers up to 50%-75% off retail. It organizes exclusive online private sales that generally last from 12 to 48 hours. Membership is free and easy to join online (without a referral). Once you login, you’re taken to their sales event landing page which shows current sales with their end times as well as future sales and their start times. They also email you the day of the sale to inform you when the sale starts and when to check in. One great thing about HauteLook is its multiple sales policy. On other sites, you can only put items from one sale in your shopping bag. If you want things from another sale on the site, you’ll have to do it separately and pay another shipping fee. HauteLook has recently cut that practice out and lets you shop from multiple sales—only paying shipping once. Refer a friend and get a $10 credit if they buy anything. HauteLook's return policy varies depending on the category of the item being purchased. Returns on apparel will be accepted within 14 days from the time your order is shipped. They issue store credit for all returns. FINAL SALE items include cosmetics & beauty items, footwear, hosiery, intimates, swimwear, vintage, jewelry & watches, leather goods, bags & wallets, sunglasses, home appliances and home goods. 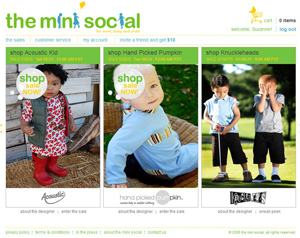 The mini social features designer clothing and accessories up to 60% off for mom, baby and child. Though it is a private, members only on-line boutique, all we had to do was sign up to receive e-mail invitations to their weekly sales. Membership is free, and each time you refer a friend who makes a purchase you get $10 to spend on their site. They accept returns within 21 days of shipment for store credit only. Final Sale items that cannot be returned include footwear, skincare, handbags, intimates, furniture and accessories, and will be noted on the site as a Final Sale. They do not do exchanges. One great thing about HauteLook is its multiple sales policy. On other sites, you can only put items from one sale in your shopping bag. If you want things from another sale on the site, you’ll have to do it separately and pay another shipping fee.